The nest is located in the Port Tobacco River Park in Charles County. A contest was recently held to name the parent birds, which are estimated to be about 8 years old. “We had over 250 submissions from all over the country and even into Canada. We had the community vote, and they selected Chandler and Hope, which is after Chandler’s Hope … a historic home here in Port Tobacco,” said Rachel Ammerman, interactive media and community outreach coordinator with the Charles County Department of Recreation, Parks and Tourism. It usually takes 35 days for an eagle egg to hatch. “When you have three eggs it can take a little bit longer, so we’re looking at Sunday for our first hatch right now,” Ammerman said. The predicted hatch dates are March 10, 11 and 13. The webcam was launched late last year, and according to the Audubon Society, it’s the first livestreaming eagle cam in the state. 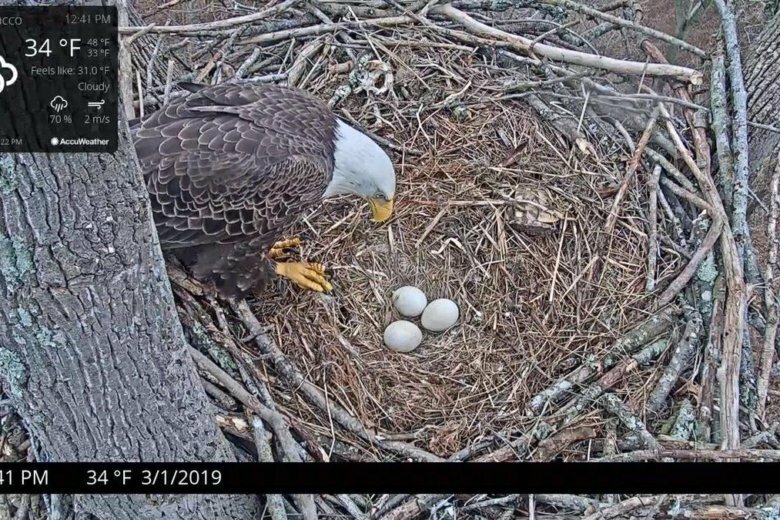 “We know that this nest has successfully fledged eagles the past two years, but this is the first time, obviously, that we’re … able to see it,” said Ammerman. Only time will tell what will happen.